The Healing Courtyards, is an important project that will leave a lasting effect on Dominican Hospital and our community. From patients and family members, to employees and physicians, all will benefit from these spaces. Over 60 scientific studies show that interaction with nature reduces pain and stress and boosts immune systems. Research based studies with actual patients showed that access to a garden can speed up healing from surgery and infections and reduce the need for pain medication, resulting in fewer post-surgical complications and less hospital time.Click HERE to learn about the scientific studies related to Healing Courtyards in a hospital setting. 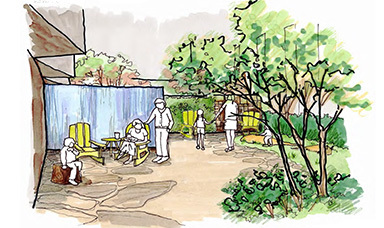 Dominican Hospital’s Healing Courtyards Initiative envisions the transformation of four courtyards to reduce stress and promote healing in patients, staff, physicians and visitors. 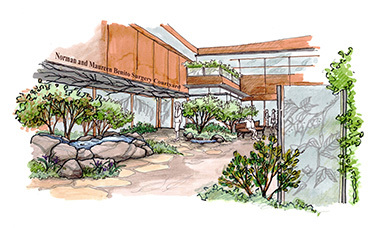 Phase I of the project includes the Monterey Peninsula Foundation Rehabilitation Garden, Norman & Maureen Benito Surgery Courtyard, and the Central Surgery Lounge & Terrace. Phase II of the project includes the Dr. Joseph T. Anzalone Family & Newborn Care Courtyard and the Norman and Pamela Santacroce Meditation Garden. Click HERE to see the complete Master Plan for the Healing Courtyards. 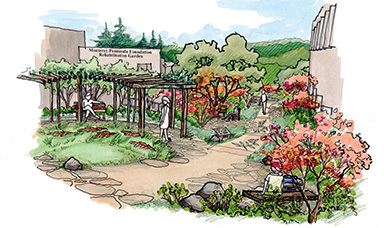 Monterey Peninsula Foundation Rehabilitation Garden - NOW OPEN AT DOMINICAN! The MPF Rehabilitation Garden is designed by physical, occupational, and speech therapists for patients with neurological conditions in our Acute Rehabilitation Unit (ARU). These are primarily patients with strokes, brain or spinal surgery, or head trauma. The Rehabilitation Garden area provides a serious, outside therapy training area with features intentionally designed to help patients improve in a real life environment. Such features include a putting green for balance, outdoor games for manual dexterity and memory function, garden signage for language skills, and various pathways, pavement surfaces, and stair configurations for patients navigating with walkers, wheelchairs, and canes. By utilizing the outdoor Rehabilitation Garden space, therapists can increases patient progress and return them home quicker. VIEW IMAGES OF THE COMPLETED GARDEN HERE. Used by over 50,000 people each year, the Central Surgery Lounge is the main waiting area for acute surgeries. Designed with the input of surgeons and nurses, the plan doubles the size of the waiting area and adds a room for surgeons to privately consult with families and friends of patients. The remodel impacts the adjoining courtyard. 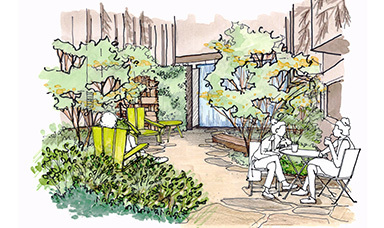 The Central Surgery Courtyard will be redesigned with water features and private respite areas to reduce stress for visitors as well as patients undergoing and recovering from surgery. The addition allows for an upstairs balcony expansion, significantly increasing the only outside space available to patients on the second floor. The Dr. Joseph T. Anzalone Family & Newborn Care Courtyard is named by the family of one of Santa Cruz’s highly regarded obstetricians, the courtyard was designed with nursing and community input.The peaceful setting allows new parents and their babies to enjoy fresh air and nature to help relieve feelings of stress and exhaustion and celebrate new births. Inspired by the stunning redwoods of the Santa Cruz mountains the courtyard will include animal sculptures for children as well as a calming water wall. The is also a special wall, "Celebrating Our Babies", located in the courtyard which commemorates babies born at Dominican, Community, or Sisters Hospitals'. This garden is designed as a quiet area for all hospital visitors, patients and staff to focus on meditation, contemplation, and mindfulness as part of their therapeutic approach. A planted green wall alongside the relaxing sound of water flowing from a water wall promises calming and peaceful effects. This tranquil setting is inspired by the stunning redwoods of the Santa Cruz Mountains. Multiple features in each courtyard are available for naming and recognition ranging from $1,000-$500,000 and can be paid over multiple years. To find out more about the plans for the courtyards and how your gift may support their timely completion, please contact Beverly Grova, VP of Philanthropy, at (831) 462-7712. Click HERE for Recognition Opportunities. © copyDate Dominican Hospital Foundation. All Rights Reserved.